Renault has produced a range of efficient family hatches and more recently, impressive hybrid and electric cars and the brand has gained a lot of support from motorists. Renault’s selection of practical cars has expanded, including models such as the Captur Sport Utility Vehicle and the tough-looking Koleos family car, which are ideal for long or adventurous journeys. 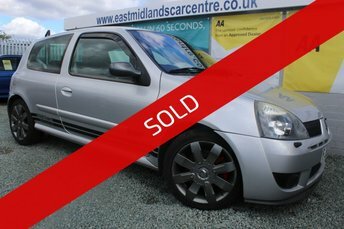 At East Midlands Car Centre, we stock some of the most popular second-hand Renault models available, and our team will strive to find the right one for you. We have many years of experience within the used car trade, and feel confident that we you will be satisfied with any vehicle you purchase from us. Call our team today for more information.